These medium-soft waxes are ideal for repairing small scratches and filling nail holes in timber. Available in 16 wood shades you simply cut a piece from the 12cm stick, soften it by kneeding it in your fingers and then rub it in to the hole or scratch. After a couple of minutes remove any excess wax by rubbing over and around the wax with a piece of cloth. A handy, quick solution to mask repairs and filling scratches. Just rub along/across the damage and remove any excess by gently rubbing with a cloth. A blend of oils Finishing Oil is used on all interior wood, turned woodwork and wooden toys. 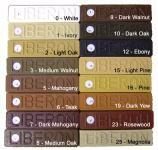 It is also suitable for worktops, kitchen tables and bathroom furniture. Highly resistant to water, alcohol and food acids. Tung Oil is ideal for use on kitchen worktops, tables, toys and objects that come into contact with food such as salad bowls. Designed to clean and rejuvinate highly polished surfaces such as French Polish, lacquer and varnish. Provides exceptional protection for all wooden surfaces and is ideal for wooden floors that experience high foot traffic. Endorsed by the Guild of Master Craftsmen the product is also EN71 Part 3 Approved - Safe for Toys. This marine formula protects against UV and chlorine even though it is clear. Highly water resistant it blocks water on the surface and protects against stains and grease marks. Suitable for decking, fences, sheds and hot tubs. Made from a blend of natural waxes including Carnauba wax. This wax gives good resistance to finger and water marks. The traditional method used to colour oak, magogany and walnut. Dissolve in hot water to achieve a brown colour. Stone Floor Cleaner: Removes dirt, grease and previous finishes from teracotta and stone floors. Stone Floor Sealer: Feeds and seals porous stone to protect against water and staining. Laminate Clean & Seal: Non-aggresive cleaner for the regular maintenance of laminate flooring. Laminate Reviver: Revives the shine on worn laminate flooring and protects against wear and tear. High Quality Steel wool for cleaning and preparing wood and metal surfaces. S&R Opinion: The finest Steelwool we have used. Very fine abrasive for producing an aged look on newly restored antiques. A hard wax it produces a high gloss finish when used to make furniture wax. 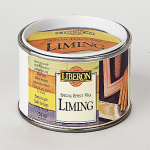 An excellent product that is used to repair surfaces prior to french polishing. Melted into the surface this product does not shatter when the excess is planed off. Disguises scratches and small blemishes on finished wooden surfaces. 3 colour tones per pack. Iron Paste: A black graphite paste used to protect cast and wrought ironwork. Antiquing Fluid Brown & Black: Used to colour bare metals and provide an antique-like finish. Rust Remover: Removes rust and inhibits further oxidation. Liming Brush: Bronze metal brush used to open the grain of the wood prior to liming. Wax Polishing Brush: Designed for buffing wax polishes on bare wood.